This Brazilian fish stew, or moqueca, is pretty much the most wonderfully flavored fish dish I've ever tried. This recipe is definitely one I'll be making over and over. 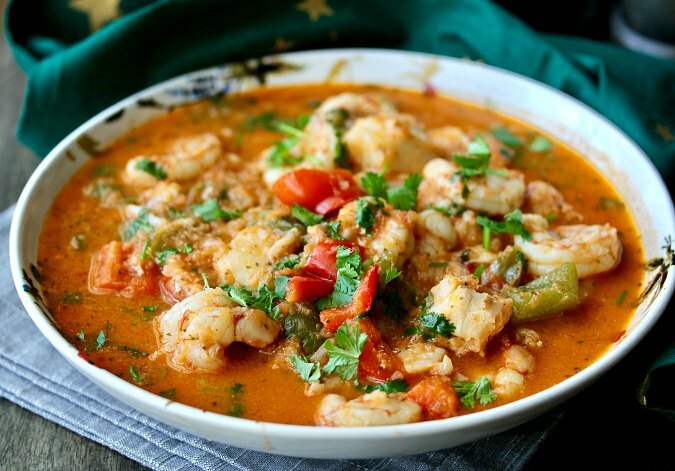 For this version of the traditional Brazilian fish stew, I used shrimp and cod. Instead of cod, you can substitute any whitefish, such as halibut, or sea bass. 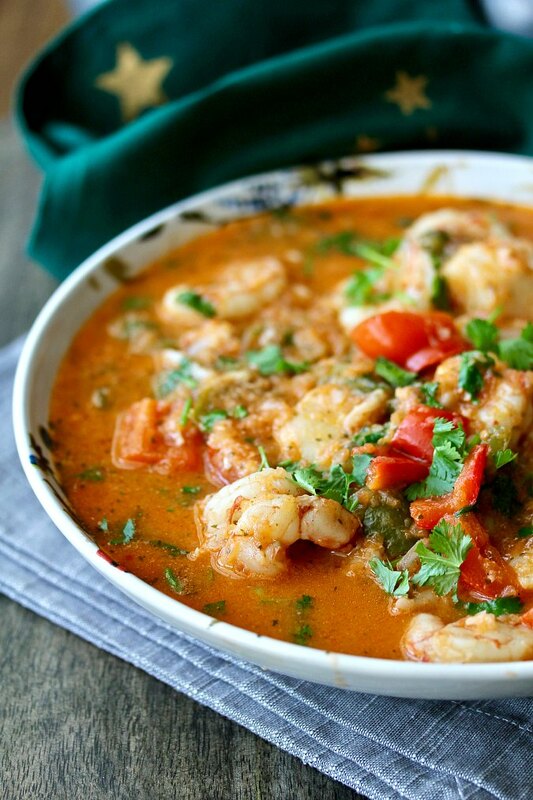 Traditional moqueca calls for palm oil, or dende oil, which adds to the red color of the stew. It's not very easy to find in stores. While I'm always up for trying new ingredients, I really didn't want to buy a new ingredient for a single dish. If you decide to try it with dende, be sure to buy a brand made from "fair trade" farms, such as Nutiva. Just add a tablespoon to the coconut milk when adding it to the pot. Note: You can also substitute a tablespoon of Hungarian sweet paprika for the dende to increase the red color of the stew. 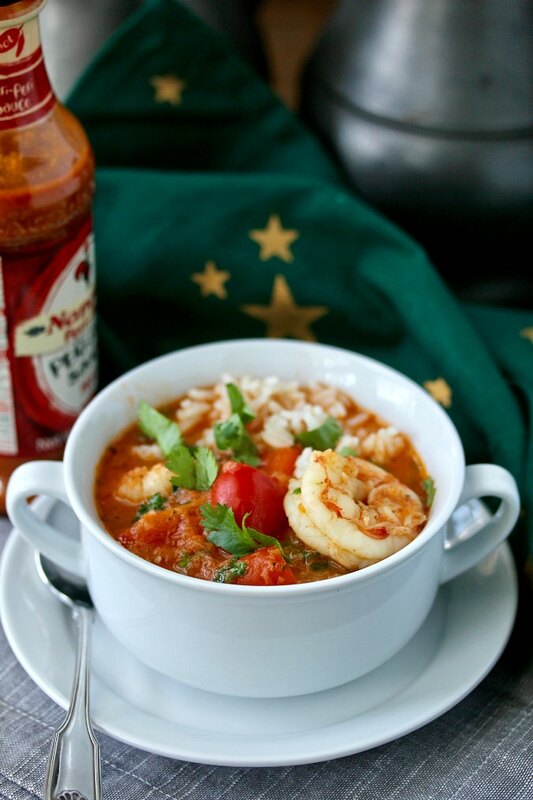 Serve this moqueca with white rice flavored with a bit of garlic, onion, and salt. So good... and this version is so easy. Make it. You won't regret it! Should I brine the shrimp before adding it to the stew? I didn't brine the shrimp (although I did briefly "dry brine" mine), but my Brazilian friend Sally of the blog, Bewitching Kitchen, swears by it. 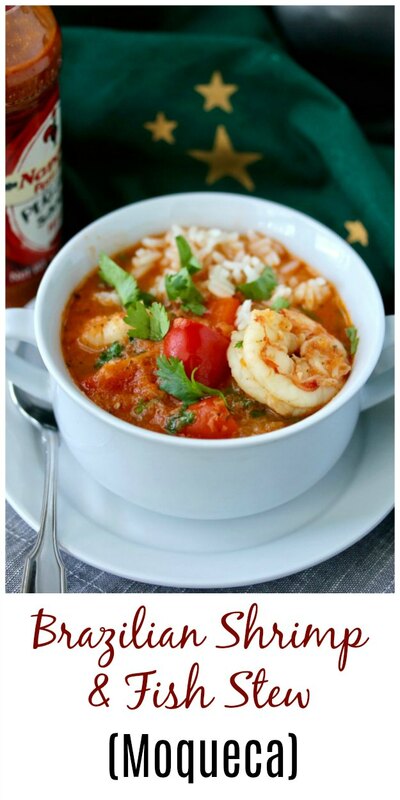 Be sure to check out her post on Moqueca here. P.S. Sally has lots of Brazilian recipes on her blog (plus many more)! What hot sauce should I use? I highly recommend Nando's Hot Peri-Peri sauce. I found it at Ralph's (Kroger). I contains the chillies that are traditional to the stew. If you can't find it, you can stir in some Sriracha, Tabasco, or your favorite hot sauce. This month, the Fish Friday group is making stews, a theme chosen by Culinary Adventures with Camilla. After the recipe, be sure to check out the rest of the seafood stews from fellow Fish Friday Foodies. In a bowl, mix the shrimp with the garlic, 1/2 teaspoon of salt, and 1/4 teaspoon of pepper. Set aside. In a food processor, process the onion, tomatoes and their juices, and 1/4 cup of the cilantro for 30 seconds. In a large Dutch oven, heat the olive oil over medium heat. Add the bell peppers and 1/2 teaspoon salt. Cook, stirring regularly, 5 to 7 minutes, until softened. Add the mixture from the food processor and 1/2 teaspoon salt to the pan. Cook for 3 to 5 minutes, until the mixture slightly thickens. Raise the heat to medium high and add the coconut milk. Bring to a full boil, add the shrimp, cod, and lime juice, and stir to make sure the fish is submerged. Cover the pot and turn off the heat. Let stand until the fish is just cooked through and opaque, 15 to 20 minutes. Stir in 2 tablespoons of hot sauce and the rest of the cilantro. Season with salt and pepper to taste and serve over rice with more hot sauce on the side. This is one of our favorite dishes as well, Karen. I keep the dende oil in the refrigerator so it stays fresh for ages, even if I don't make moqueca often. Yours looks wonderful! That's a great idea. I'll have to get some! This looks delicious Karen. I can't use coconut milk in recipes. It has adverse affects on hubby so I just you cream instead. Not the same but still pretty good. I think it would be fine to use an alternative Wendy. This is the recipe I was thinking of when I picked this theme. It's a family favorite. Thanks for sharing your version, Karen. Did I steal your idea? Oh no! Thanks for the great theme. I love a spicy stew and this would be perfect for tomorrow when the temps finally dip. I should make it again - and yes, I don't buy dende oil ever - first, I find that without the dish is still very tasty, and second it stains like nobody's business - the only time I bought it, years ago, a very small leak stained our cabinet forever. My pleasure. I would not think of posting anything Brazilian without mentioning you! Glad to hear your opinion on dende. I'm trying to cut back on the single use ingredients in my house! Oh yes. This is definitely happening:) Are you using frozen cod fillets? We can find fresh monkfish this season, which has a thick tail we are using in soups. This would also work right? Thank you for the AMAZING RECIPE dear Karen, pinned! I did use frozen cod fillets, but if you have access to fresh, never frozen monkfish, that would be ideal! That dish looks so amazing. Must try this. This looks so good, I will definitely have to try it. In fact it may get made in the next couple of days especially since I have all the ingredients to hand, with the exception of the peppers. Thanks so much for linking this to First Monday Favorites. This has been one of my all time favorites.